This simple, silver ring is stylish, sleek and lovely to wear. Delicate, lightweight and airy these Seafoam Rings are handcrafted with individuality and uniqueness in mind. 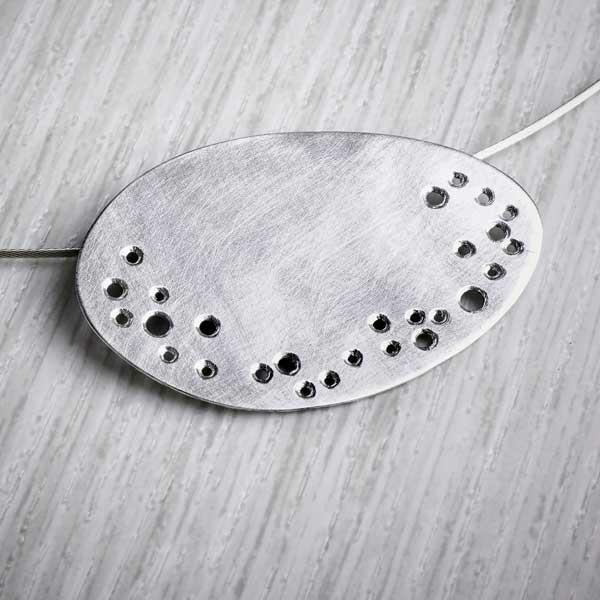 Simple, sleek ring bands made from recycled EcoSilver are drilled with tiny holes. Inspiration is taken from the seafoam generated by the incoming and outgoing tide. Tiny white bubbles that wash up at your feet and slowly fade. They are drilled in a random fashion making each ring completely unique. Suitable for both men and women. The ring shanks and tapered at each end and formed into an adjustable ring. Please make your ring size selection before adding this item to your basket. This will ensure that the ring is made to your required size, but can be adjusted if your ring sizes changes or you choose to wear the ring on a different finger. Given a brushed finish, each recycled silver ring is completely unique. The photographs show an example of what you will receive – as each ring is handmade, the one you receive will differ slightly from the one photographed. Store your ring in its glassine bag or within a ziplock bag.